Part of the draw in watching tentpole flicks like the Fast & Furious franchise or James Bond and Batman films, is seeing how much more ridiculous and advanced the vehicles get in each successive feature. Star Wars fans, however, are much more likely to get excited when things stay almost exactly the same as they were. Exhibit A: The first close-up shot of the “new” Millennium Falcon for J.J. Abrams Star Wars: The Force Awakens. Bow down to its retro-future beauty. 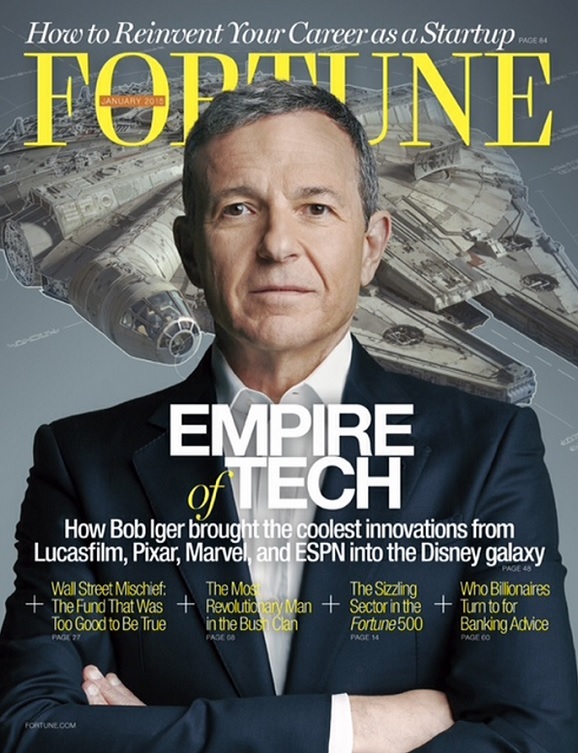 The above shot, for those unable to read yellow letters through a man’s cranium, is the cover of the latest issue of Fortune magazine, and features Walt Disney Co. CEO Bob Iger superimposed over the Falcon, which will most certainly usher in a new wave of billion-dollar grosses for the House of Mouse. We’ve already seen Han Solo’s beloved hunk-a-junk for that wild camera shot in the Force Awakens trailer last month, and again in the behind-the-scenes video that Abrams put out—as well as those drone photos from earlier this year—but these are the first official close-up shots in print form. 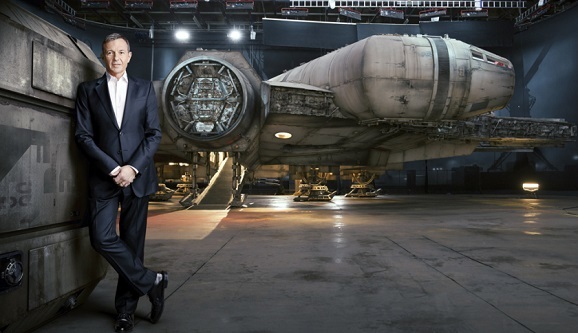 Luckily, it isn’t just on the cover, as there’s another shot within the magazine of Iger just standing around casually as if the coolest spaceship in all of fiction wasn’t Photoshop-parked behind him, ready for someone to hop in and have adventures. Check it out. Seeing the Falcon parked there makes me wary about ever walking into my garage again, as not to be disappointed every time. Not that I’d trust myself in a vehicle so large and powerful…nor would I want to vacuum Wookiee fur off of my passenger seat every time I went anywhere. The Fortune story is an intriguing one, and Iger gives a good lesson in how Disney works as a company-inhaling mega-corporation, overseeing a slew of different franchise-producing studios and keeping quality control number one. He unfortunately doesn’t go into details on where the plot of The Force Awakens goes, or what’s different about this updated Millennium Falcon, but then I’m not sure he would be the guy to get blood flowing anyway. Rumors recently kicked up again about a Han Solo spinoff film, which means we might get to see yet another version of the Falcon coming to theaters at some point in the future. But seriously, while looking at the ship inside of a giant hangar is pretty cool and all, I just want to see it in action again, and moving my head around my computer screen while making “whoosh” noises just isn’t cutting it.